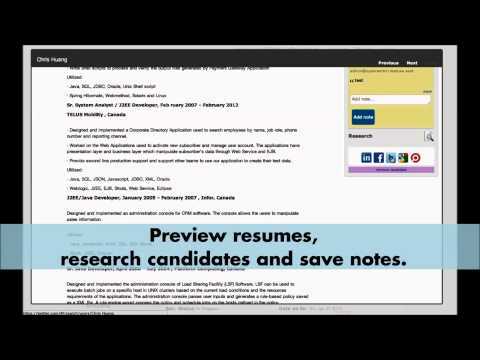 Broadbean provides job posting and candidate search tools for recruiters. Broadbean is a software-as-a-service platform that allows recruiters to quickly distribute job adverts to job boards across the globe, sort and filter candidates with user-defined criteria, and analyze the hiring process for continual improvement. With features that give users oversight of ad spend, automatic aggregation across popular job boards, and social media integration, Broadbean consolidates a wealth of formerly disparate routines into one application. Broadbean’s functions extend beyond job posting. The SaaS features candidate management as well as application tracking system (ATS) integration. Broadbean streamlines this process, placing the focus on speed and ROI. It does this while improving the overall quality of the experience for candidates by connecting them with relevant roles, even after the position for which they originally applied has been filled. The software also creates an applicant database of all candidates who complete applications, for future reference. The software also includes employee referral tools, which can help existing employees introduce recruiters to highly qualified candidates. Broadbean’s social media integration and gamification tools bring existing employees into the recruiting process by facilitating incentives for their involvement. Broadbean tools function as a Web-based SaaS within any browser and on popular social networking sites. Overall, it is a good software that will save a lot of time for Recruiters if they are using multiple job boards to post their jobs on. If you use more than one Job Board, this software will save you time. First used this in 2015, and the best feature which we used all the time was to post how Job Adverts on Broadbean, and Boradbean will post/advertise you job across all of the Job Boards that you use. Without this you would usually have to go to each Job Board and post your advert which can be extremely time consuming if you are using 3 or more Job Boards which a lot of Recruitment companies do. If you use more than one Job Board, this software will save you time. First used this in 2015, and the best feature which we used all the time was to post how Job Adverts on Broadbean, and Boradbean will post/advertise you job across all of the Job Boards that you use. Without this you would usually have to go to each Job Board and post your advert which can be extremely time consuming if you are using 3 or more Job Boards which a lot of Recruitment companies do. Nothing really to complain about with Broadbean. Occasionally I had problems with the Software freezing on me, but this was not a re-occurring issue. Also, if you do have problems with the Software it can be a nightmare to reach Customer Service. Ease of use is what took our company from Daxtra to Broadbean. The user-friendliness of Broadbean was much better than competitors. Our user found fewer issues with the integration with our ATS. The concept of shortlisting matched out compnay terminolgy as well, which made training much smoother. Support can tend to point the finger at the other vendors. Since Broadbean deal with all the job boards, we tend to see that they would alwasy point the finger at the other vendors when there are issues. N/AI love how quickly you can post to 10+ sites at once. Overall the site is easy and intuitive for all of our users. I love how quickly you can post to 10+ sites at once. Overall the site is easy and intuitive for all of our users. Does a job but terrible customer service! The customer service is diabolical! Miss-out on some candidates if you don't always search direct. Always getting things wrong. Expensive. Please contact Broadbean for pricing information. -	Quickly post job advertisements across job boards from a single interface. -	Sort and filter candidates with Broadbean’s intuitive search features. -	Automatically match highly qualified candidates with job openings. -	Inspire engagement from existing employees with Broadbean’s social media and gamification tools. - Create an employee database to fill future positions more efficiently. Below are some frequently asked questions for Broadbean. Q. What type of pricing plans does Broadbean offer? Q. Who are the typical users of Broadbean? Q. What languages does Broadbean support? Q. Does Broadbean support mobile devices? Q. Does Broadbean offer an API? Yes, Broadbean has an API available for use. Q. What other apps does Broadbean integrate with? Q. What level of support does Broadbean offer? Q. Which apps is Broadbean compared to most often?